It may be made of brass, but this fish can still flap a fin and touch its tail. 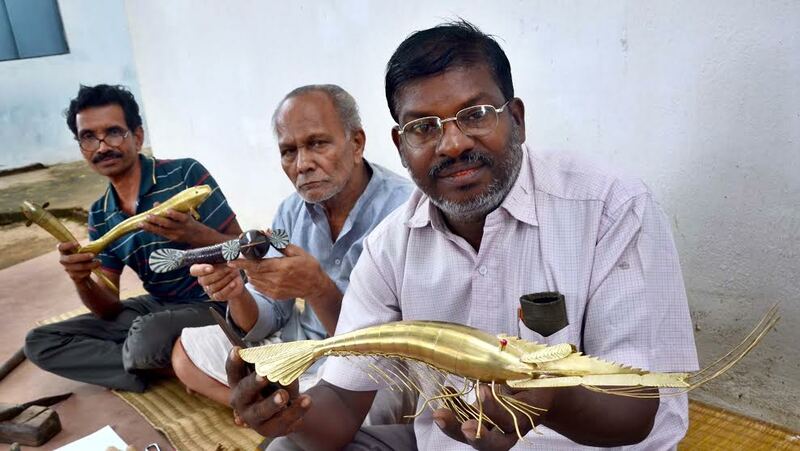 The craft of making the flexible brass fish occupies a significant place in Odisha’s rich handicraft tradition. In the lanes of Belaguntha village in Ganjam district of Odisha, three craftsmen from the Kansari community—Pradeep Maharana, Maheswar Maharana and Sushanta Sahoo—have kept this unique art form alive, which has been fighting obscurity in the face of modernity. While the craft was started by Pradeep’s ancestors during the rule of the Bhanja kings in the 9th century, Sushanta learnt it from Pradeep’s parents. Maheswar, 85, is the only remaining artist in the village, who can make flexible fishes in wood. In the 90s, Maheswar made the Matsya (Sanskrit for fish) avatar of Lord Jagannath for which, he got the Odisha State Handicraft Award. His creation comprised of an idol of Lord Jagannath coming out of the mouth of a wooden flexible fish. Today, these artists and their family members are the only practitioners of the craft in Belaguntha. They do train youngsters in art colleges of the state, and sometimes outside, but none of the youths have taken up the craft as a profession. The three artists participate in training sessions and exhibitions so that people come to know about their craft. The trio uses brass sheets, wires and wood to make various designs of fish that are in huge demand in the international handicraft market. “Despite the demand, not many are coming forward today to take up the craft as it is labour intensive,” says Pradeep, who is an electrician by profession. He had received the State Handicraft Award in 2000 for his excellence in the art form. Placing a golden prawn with red eyes and three glinting fishes of varied lengths on a sheet of white paper, Sushanta demonstrates how the fish are made. The fish is divided into three portions—head, stomach and the tail. The head is the most important part and is prepared first and accordingly, the size of the body is decided, he says. The artist cuts brass sheets and dexterously shapes them into round blocks with wavy edges, giving them the shape of fish scales. A 20-inch fish requires at least 50 such blocks that are stitched together with a brass wire in a manner that the fish becomes bendable. Making a fish is easier compared to a prawn. “Since making a prawn involves a lot of workmanship and detailing, it takes a lot of time,” he says, adding that though it is labour intensive, making a flexible fish now is less tedious because of invention of machines that can roll brass sheets. “Earlier, we used to manually beat brass blocks to make sheets and wires,” says Sushanta. The artists have now started making flexible brass snakes that are usually offered by devotees in Shiva temples. 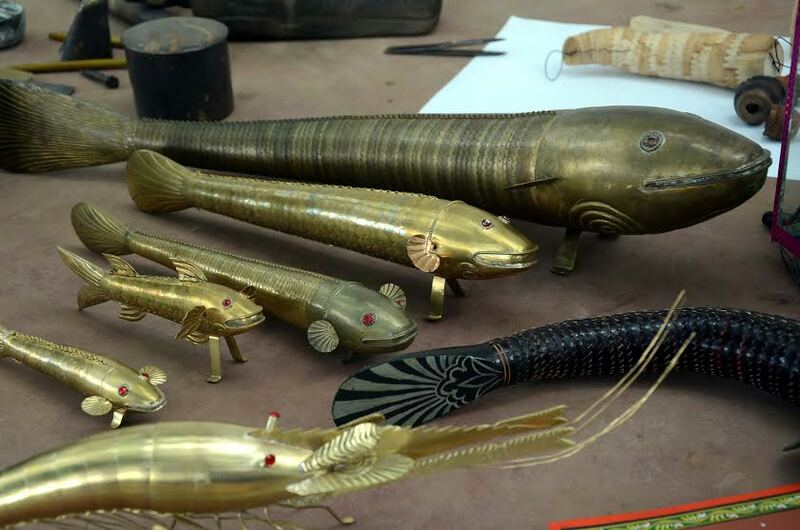 Although there are no records in history on the origin of the craft, Pradeep says his ancestors were hired as sculptors by Bhanja rulers and used to demonstrate the technique of making flexible brass fish at the Bhanja King’s court. During the British rule, his grandparents used to supply the handicraft to Victoria Technical Institute in Madras. The handicraft has a mythological significance as members of the Kansari community consider the fish auspicious. Since ancient times, the craft has been associated with important rituals and social occasions. “In our village when a girl gets married, she is given a small brass fish, along with other valuables, as a good luck charm,” says Maheshwar. Pointing to the wooden Matsya avatar that fetched him the state award, Maheswar says he decided to work with wood as a medium as it was a cheaper option. “Labour that goes into working on both the mediums is the same. In fact, making the scales either with brass or wood requires a lot of practice and patience,” he says. The three artisans say the government should come forward to help them with design intervention, which is the need of the hour. “The handicraft is extremely rich which is why, it has sustained for several decades. However, with the market demand fast changing, we need to bring in new designs,” says Maheswar. Your blog is a goldmine of information. I was researching Ganjapa card game for a possible quiz question being organised on the occasion of Utkal Diwas. I really hope your blog gets more popular. You’ve put in much effort in all your articles and it shows.